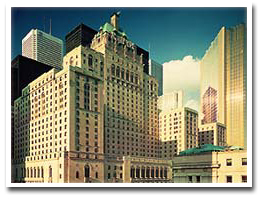 The symposium will take place in the Royal York Hotel, in dowtown Toronto. We have negotiated a special rate for symposium attendees of CAD$220.00 for a Canadian Pacific room, or CAD$290.00 for a Pacific Premier room. Please ask for the 'IEEE International Symposium on Requirements Engineering' to ensure you get the symposium rate. 100 Front St. West at York Street. On the North side of Front St., at York Street. Right across from Union Station. To reserve a room, please contact the hotel directly. On line reservation is also available. Attention Students: If you are interested in finding someone to share a hotel room with, please contact Wendy Liu at the University of Toronto. Wendy will attempt to match you up with another student, so that you share the cost of the room.